Junk King is your one stop shop for Houston East – Equipment Removal. There are lots of good reasons to give us a call or book online. We remove almost everything and you don’t need to lift a finger to get rid of everything from old office furniture to that treadmill that’s been sitting in your basement for years. We are also a proud member of the Houston community. That means that we supply efficient and affordable services to all of our clients. What’s more, Junk King is always at the forefront of donating and recycling. It’s important to us after one of our Houston East – Equipment Removal projects, that we send everything to its proper location to lessen everyone’s carbon footprint. When you use our services there’s no need for you to worry about disposal and pick up of those items that have been bothering you for years. It’s convenient and affordable to get rid of that old furniture that’s been sitting in the corner of the garage. You’ll wonder why you didn’t call before when you take advantage of our fast and convenient booking online tab to get Houston East – Equipment Removal services. Houston East – Equipment Removal and So Much More!!! We are proud of all of the different kinds of services that we offer under the Junk King umbrella. Fast and efficient as well as affordable and friendly. Those are four of the words that we hear over and over again from our Houston clients. We look after a variety of needs. For example, if you’re landlord and you’re looking to get rid of the equipment left behind by a tenant, we can help. 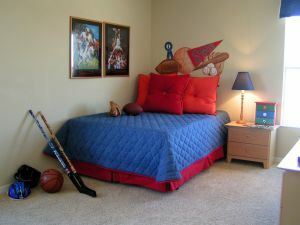 It’s always important to make sure that any rental space looks as good as possible when you’re trying to fill a vacancy. Getting rid of all the junk that’s been left behind can sometimes be overwhelming. All you need to do to get started is book an appointment online or call us. Remember that all the professionals that come to look after your junk are insured and committed to the very best customer service. The equipment that we will haul away includes appliances and furniture as well as construction and even yard waste removal. Our Junk King Houston East – Equipment Removal services are waiting for you. This entry was posted in East Houston Junk Removal, Junk King East Houston, Junk Pickup In East Houston, Junk Removal Houston on January 29, 2019 by Junk King. Last updated January 29, 2019 . 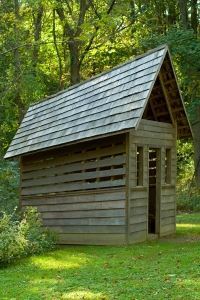 Are you prepared to take an inventory of your garage? If this area has become the home’s official storage unit, then the last thing you might find in there is your car. Instead, they could be plenty of car parts and a tire or two. There could also be a workbench that is so overrun with clutter that you can’t get any work done there. 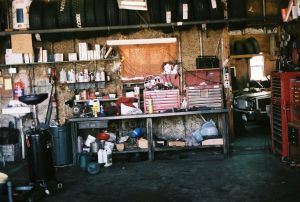 So far, you’ve got a garage without a car and workbench without work! Along the walls, you could have placed shelves to hold boxes. There could be a few boxes labeled “Halloween” or “Christmas.” Obviously, you want to hold onto those but what about the rest of the boxes. Sometimes things go into storage like winter clothes that stay so long in storage they go out of style. The might be boxes left over from your last move. 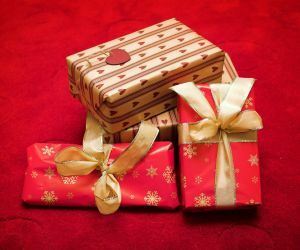 Maybe there are gifts that you never intend on using or re-gifting. Bottom line, those shelves could be full of useless junk. If all of this sounds like your garage, then the next call you make should be to Junk King. Before the Junk King crew shows up, you might want to take that inventory and set aside all the things you know you want to hold onto. As for everything else, just tell the Junk King crew to take it all away. They’ll back up their truck and all that junk is as good as gone. Once that stuff has been removed you can rethink that space. Sure, you can start parking your car in there once again but maybe this is where you’ll set up a home gym or arts and craft corner. With a little extra work, you could even turn this space into a spare bedroom or home office. All it takes is a little drywall, some carpeting and sealing up the garage door. Easy work for a DIY project! 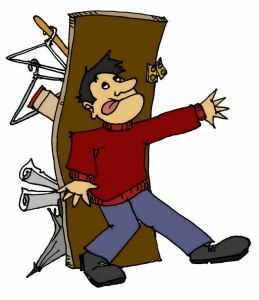 Along with your garage cleanup, Junk King can go anywhere else in your home to remove your clutter. That also includes your front and backyard. If you plan on putting up some of those holiday decorations, then you want to make sure all the eyesores have been removed first. Junk King can help get your garage and home cleaned from top to bottom. Call today to set up your junk removal appointment. This entry was posted in What's In Your East Houston Garage? and tagged Garage, Junk King, junk removal on October 22, 2014 by Jose Urdaneta. Last updated August 1, 2017 . 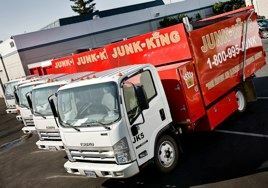 If you’re ready to get rid of your junk, the only call you need to make is to Junk King. How does Junk King work? First, decide what you want to throw out. This doesn’t have to be a final list but a general idea you can tell the Junk King rep you’ll speak to when setting up your junk removal appointment. When the two-man Junk King crew arrives for the session, you’ll show them what you want taken away. They’ll then provide you with an estimate based on how much space your junk will occupy on the back of the truck. When you agree to that price, the job can begin. The crew will remove what you want taken away and sweep up when the job is done. Junk King is a national company of franchise operations. The standards set by the parent company includes every branch to be licensed, bonded and insured. This means you can depend on the Junk King crews to treat you with the utmost professionalism. What kind of items can Junk King remove? If you want it gone, Junk King can take it away. The Junk King crew is going to be doing all the lifting and loading. This means you can finally toss out those bulky and oversized items you’ve been handing onto. This means all the furniture, exercise equipment, appliances and boxes of unused stuff can finally be gone. Additionally, the Junk King crew can work wonders in your backyard removing any type of landscaping waste, construction debris, auto parts, tires, patio furniture, grills and lawnmowers. Everything can be gone with one Junk King junk removal appointment. Can you handle bigger jobs? 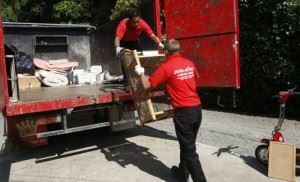 Junk King can take care of massive cleanup jobs for foreclosures, estate sales and even hoarder cleanouts. As with your regular junk removal session, you only have to tell the crew what you want removed and it will be hauled away. You can even say, “Take everything” and it will be handled. 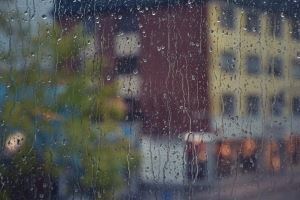 Junk King can also show up after a storm to remove any debris or water damaged items. Why shouldn’t I rent a dumpster instead of Junk King? Although it seems like a dumpster can hold everything you’re throwing out, you can only fill up the dumpster to just below the rim. This means if you have extra junk, you’ll have to rent a second container. With Junk King, you’ll be able to get rid of all your junk in a single appointment. You also won’t have to do any of the work. For hassle free, professional junk removal service, Junk King is the only way to go. This entry was posted in Junk Removal FAQs In Pasadena Texas and tagged Junk King, junk removal, Junk Removal FAQs on August 19, 2014 by Jose Urdaneta. Last updated August 1, 2017 .